Domoic Acid: The Amnesic Shellfish Toxin that…what was I saying? I love my readers. You’re a smart group of people that likes the same things I do: poisons, toxins, science, chemistry, crime, history, and all of the above mixed into a casserole. But there’s something I don’t quite understand . . . what do you all have against shellfish toxins? I’ve written about two of them, the diarrheal and paralytic, hyperlinked above (hint, hint), but they are among my least viewed posts. I just want to know why? Is it because they were written early on, before I was famous? Just kidding, folks. Or maybe a lot of people aren’t near the coasts, and could care less about shellfish? I can understand that, but you’re missing out on some cool chemistry and toxins, and I’m going to change your mind with amnesic shellfish poisoning (ASP). Imagine a toxin that induces gastrointestinal upset, confusion, and seizures. If enough is consumed, you could even die. But let’s be positive and say you lived, now you’re facing a lifetime of irreversible short-term memory loss. Interested? What if I also told you it was the inspiration for Alfred Hitchcock’s classic film “The Birds”? Ready for more? I thought so. Phytoplankton of the Pseudo-nitzschia genus form harmful algal blooms throughout much of the world and produces the potent neurotoxin domoic acid. During these blooms, bivalve filter feeders – such as clams, mussels, and scallops – capture the phytoplankton and accumulate domoic acid in all parts of their body, in what is known as bioaccumulation. The accumulation and rates of elimination of domoic acid, however, vary among bivalve species. 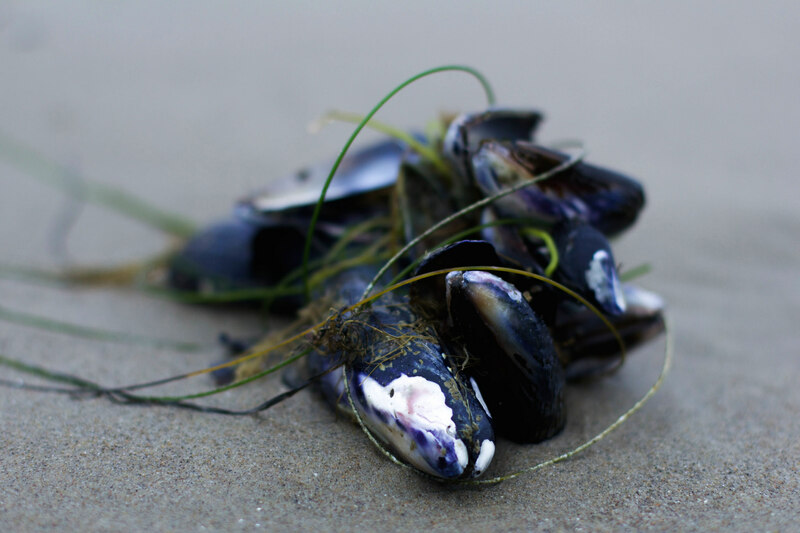 Blue mussels can eliminate 50% of domoic acid in 24 hours, whereas razor clams take 86 days. And some species of fish, like anchovies and mackerel, are also affected and accumulate domoic acid. Both bivalves and fish seem to be resistant to the neurotoxin, but the same can not be said of the larger animals that feed on them. Like humans. In late 1987 on Prince Edward Island, Canada, local health departments fielded more than 250 reports of generalized, acute illness presumed to be food poisoning. Common reported symptoms were vomitting, diarrhea, incapacitating headaches, and short-term memory loss. In all, 19 were hospitalized, with 12 going to intensive care because of seizures or coma, and 3 never left the hospital alive. The culprit? Mussels. Cultured blue mussels were harvested from Cardigan Bay during a phytoplankton bloom, consisting primarily of Pseudo-nitzschia. Analysis of mussels, from homes and restaurants, confirmed the presence of domoic acid in concentrations from 310-1,280 mg/kg mussels. In symptomatic patients, the amount of ingested domoic acid ranged from approximately 60-290 mg. To put those numbers into perspective, the FDA allows for domoic acid up to 20 mg/kg mussels, and the estimated amount needed to bring about gastrointestinal distress in humans is 60 mg.
Domoic acid, unaffected by storage or any variety of cooking methods, has an interesting mode of action. In the body, the main excitatory neurotransmitter is glutamate (glutamic acid), and acts on glutamate receptors located on neuronal cells in the nervous system and the brain. These receptors are critical for synaptic plasticity – modifying the strength of synaptic transmissions over time – and are responsible for learning and memory. Domoic acid, an analog of kainic acid, which itself mimics glutamic acid, has a high affinity for, and activates, the glutamate receptors. The problem is that it is excitotoxic, which is simply the killing of nerve cells by being over-stimulated, and allows high concentrations of calcium to enter the cells. Once there, the excess calcium activates a host of enzymes that ultimately damages, and destroys, essential components of the cell. In the human brain, domoic acid does its damage on the hippocampus, which is important for short-term memory and spatial navigation. Getting back to my Canadian friends, neurological dysfunction was studied in 14 victims. Of those, 12 exhibited anterograde amnesia – the inability to form new memories after the outbreak – 6 months after exposure. The most severely afflicted individuals also exhibited retrograde amnesia, the inability to recall events or memories from before the outbreak. And remember those that died? Neuropathology showed necrosis in the hippocampus, literally destroying parts of the brain. The sinister aspect of shellfish poisonings is that you can’t tell you’ll be poisoned by looking at the clam, scallop, or mussel. If you’re in the woods collecting mushrooms and berries, you’ve got a fighting chance, provided you’ve got a guidebook or an expert along with you. But shellfish, not so much, because even if the algal bloom is gone, domoic acid can still remain. Today, we rely on state fish and wildlife agencies to track algal blooms and toxin levels in shellfish. Once concentrations reach a limit, beaches are closed and warnings go out. And whether you believe in climate change, global warming, or whatever we decide to call it next week or not, our impact on the environment and changing weather patterns are causing an increase in frequency and magnitude of harmful algal blooms, and the toxins that come with them. They’re here to stay. Ahhh, you thought I forgot about the Alfred Hitchcock teaser. Not a chance, I love this stuff! Animals are also affected by domoic acid, especially sea lions, which eat domoic acid containing fish, but also birds. In 1961, in North Monterey Bay, California, thousands of sooty shearwaters – a type of seabird – were reported to regurgitate anchovies, fly into objects, and fall dead out of the air. 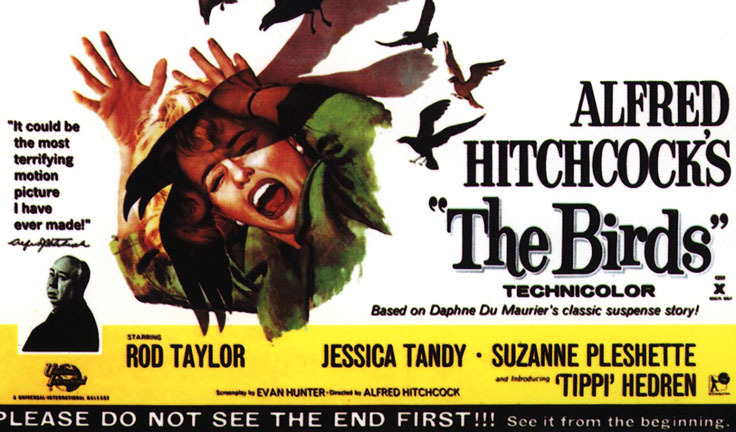 Local resident and filmmaker Alfred Hitchcock took note, and used it, along with a short story by Daphne Du Maurier, as inspiration for his 1963 classic horror film “The Birds.” Examination of the birds’ stomach contents revealed large amounts of toxin-producing plankton, most likely those that create domoic acid. Hopefully I’ve convinced you of the awesomeness of another marine toxin. So when you see a post down the road on the last of these shellfish poisonings, Neurotoxic Shellfish Poisoning, you’ll be rushing to read it. Jeffery, B., T. Barlow, K. Moizer, S. Paul, and C. Boyle. “Amnesic Shellfish Poison.” Food and Chemical Toxicology 42.4 (2004): 545-57. Lefebvre, Kathi A., and Alison Robertson. “Domoic Acid and Human Exposure Risks: A Review.” Toxicon 56.2 (2010): 218-30. Perl, Trish M., Lucie Bédard, Tom Kosatsky, James C. Hockin, Ewen C.d. Todd, and Robert S. Remis. “An Outbreak of Toxic Encephalopathy Caused by Eating Mussels Contaminated with Domoic Acid.” New England Journal of Medicine N Engl J Med 322.25 (1990): 1775-780. Teitelbaum, Jeanne S., Robert J. Zatorre, Stirling Carpenter, Daniel Gendron, Alan C. Evans, Albert Gjedde, and Neil R. Cashman. “Neurologic Sequelae of Domoic Acid Intoxication Due to the Ingestion of Contaminated Mussels.” New England Journal of Medicine N Engl J Med 322.25 (1990): 1781-787. Hampson, David R., and Jerrie Lynn Manalo. “The Activation of Glutamate Receptors by Kainic Acid and Domoic Acid.” Nat. Toxins Natural Toxins 6.3-4 (1998): 153-58. Tags: Alfred Hitchcock, amnesia, amnesic shellfish poisoning, domoic acid, glutamate, glutamate receptor, harmful algal blooms, phytoplankton, shellfish, shellfish poison, The Birds. Bookmark the permalink. Will do, just keep the stories coming. I am an Italian physician and I somehow came across your blog a few months ago – and fell in love with it on the spot. You were born in Washington state so I understand your perspective, with an emphasis on North American Nature’s poisons. Yet I am sure you could expand the readership of your fantastic blog if only you widened your perspective. At least to Europe, to begin with. For instance, your most delightful, in-depth yet enjoyable lecture on domoic acid, the limbic system and hippocampus, synaptic plasticity and memory equally applies to the American Pacific coast and the tiny Adriatic gulf of the Mediterranean sea [ Domoic acid–a new toxin in the Croatian Adriatic shellfish toxin profile. Molecules. 2010 Oct 8;15(10):6835-49. doi: 10.3390/molecules15106835 ]. Yet, in the Adriatic sea clam andshelfish are big business whilst phytoplacton and algal explosions with coloured waves have been increasingly common over the years in summer (the Po river valley and plain of northern Italy is one of the most astonishing concencentration of art and architectural masterpieces in the world, but also one of the most heavily urbanised industrial powerhouses of the planet – and tons of phosphorus freely flows to the sea). Don’t forget that around the Mediterranean cradle of history still live more people than in all of the U.S. – and I think they could be most interested to learn something more about domoic acid and shellfish-related anterograde amnesy from your fantastic plainly written, yet scientifically without spot, blog. You are right, of course. I receive about 76% of my viewers from the US, UK, and the Canada. Currently 0.54% come from Italy, sandwiched between Russia and Denmark. I’ll make an effort to make it a bit more international. Thanks for the kind words! Dear Justin, I must say you were absolutely right when you wrote “what do you all have against shellfish toxins?” at the beginning of your article. After my post at the beginning of August 2015, no one else seems to have shown any interest in anterograde amnesia. I wonder why, too. I have enjoyed your blog for many hours this evening (I was looking for some ideas for a lesson to to some graduate medical students, I must confess). By the way, I hope that viewers from Italy have grown over the last few years from that miserable 0.54% in 2015 — if only because I always show to be a fanatical fan of your blog with the students and people attending my lessons and lectures. I also hope you have overcome your problems by now.